The first successful surgical management of a ruptured tubal pregnancy occurred in April 1883, when the British surgeon Robert Lawson Tait performed a laparotomy and ligated the ruptured tube and the broad ligament. At a time when ectopic pregnancy was associated with a greater than 60% mortality rate, Tait lost only 2 of the first 42 patients on whom he operated. By the 1920s, laparotomy and ligation of the bleeding vessels with removal of the affected tube had become the standard of care, and it remained so until the late 1970s, when operative laparoscopy and salpingostomy replaced laparotomy and salpingectomy. Go to Ectopic Pregnancy, Emergent Management of Ectopic Pregnancy, and Ultrasonographic Imaging in the Diagnosis of Ectopic Pregnancy for complete information on these topics. For patient education resources, see Ectopic Pregnancy. The patient is not a suitable candidate for medical therapy. The patient has a heterotopic pregnancy with a viable intrauterine pregnancy. The patient is hemodynamically unstable and needs immediate treatment. The patient has a medically treatable ectopic pregnancy. The patient has other medical conditions that would make the risks associated with surgery unacceptable. In a patient who has completed childbearing and no longer desires fertility, in a patient with a history of an ectopic pregnancy in the same tube, or in a patient with severely damaged tubes, total salpingectomy is the procedure of choice. The presence of uncontrolled bleeding and hemodynamic instability warrants the choice of radical surgery over conservative methods. The preferred approach varies according to the location of the pregnancy. In all instances, regardless of desired fertility, fully inform the patient of the possibility of a laparotomy with bilateral salpingectomy. Obtain large-bore venous access and start fluid resuscitation. Make sure blood is available. Do not delay the operation; the patient has an active bleeding site, and it must be stopped as soon as possible. Place a Foley catheter before starting the procedure. 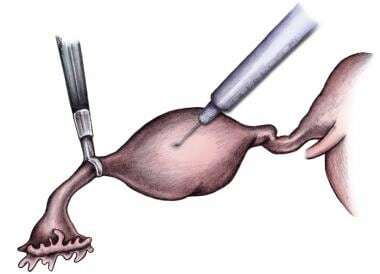 Insertion of either a Hulka tenaculum or a Harris-Kronner uterine manipulator/injector (HUMI) device into the uterus may facilitate manipulation of the tube during surgery. With advances in the ability to make the diagnosis earlier and improvements in microsurgical techniques, conservative surgery has replaced the once-standard laparotomy with salpingectomy. Within the past 2 decades, a more conservative surgical approach to unruptured ectopic pregnancy using minimally invasive surgery has been advocated to preserve tubal function. Surgical therapy may be provided either via open laparotomy or via the laparoscopic route. Laparoscopy has become the recommended approach in most cases. Laparotomy is usually reserved for patients who are hemodynamically unstable or patients with cornual ectopic pregnancies. It is also preferred for surgeons inexperienced in laparoscopy and for patients in whom a laparoscopic approach is difficult (eg, secondary to the presence of multiple dense adhesions, obesity, or massive hemoperitoneum). Multiple studies have demonstrated that laparoscopic treatment of ectopic pregnancy results in fewer postoperative adhesions than laparotomy. Furthermore, laparoscopy is associated with significantly less blood loss and a reduced need for analgesia. Finally, laparoscopy reduces cost, hospitalization, and convalescence period. Risk factors for converting laparoscopy to laparotomy should be considered; these include multiple prior surgeries, pelvic adhesions, skill of the surgeon and surgical staff, availability of the equipment, and condition of the patient. A meta-analysis of medical versus surgical therapy for ectopic pregnancy indicated that laparoscopic surgery for ectopic pregnancy was the most cost-effective approach. [4, 5] Medical therapy using methotrexate was also cost-effective for beta human chorionic gonadotropin (β-hCG) levels lower than 3000 mIU/mL. Both approaches were found effective in appropriately selected patients with adequate follow-up. The ectopic pregnancy has ruptured. Future fertility is not desired. The ectopic pregnancy represents a failure of sterilization. The tube has previously been reconstructed. The ectopic pregnancy is in the blind-ending distal segment after a previous partial salpingectomy. The current pregnancy represents a chronic tubal pregnancy. In the absence of any of the above indications for salpingectomy, salpingotomy may be performed. If the ectopic pregnancy is at the fimbria, then fimbrial evacuation is feasible, in the absence of indications for salpingectomy. Partial salpingectomy may be indicated if the pregnancy is in the midportion of the tube, if none of the indications for salpingectomy is present, and if the patient may be a candidate for later tubal reanastomosis. Throughout the procedure, take care to minimize blood loss and reduce the potential for retained trophoblastic tissue, which can reimplant and persist. Remove large gestations in an endoscopic bag, and perform copious irrigation and suctioning to remove any remaining fragments. Inspect the peritoneal cavity and remove any detected residual trophoblastic tissue. Note the condition of the contralateral tube, the presence of adhesions, or other pathologic processes because this helps in the postoperative counseling of the patient with regard to future fertility potential. Linear salpingostomy along the antimesenteric border to remove the products of conception is the procedure of choice for unruptured ectopic pregnancies in the ampullary portion of the tube. Ectopic pregnancies in the ampulla are usually located between the lumen and the serosa and, thus, are ideal candidates for linear salpingostomy. Several studies have not found primary closure of the tubal incision (salpingotomy) to have any significant advantages over healing by secondary intention (salpingostomy). The involved tube is identified and freed from surrounding structures. To minimize bleeding, a dilute solution containing 20 U of vasopressin in 20 mL of isotonic sodium chloride solution (some authors use 50 mL) may be injected into the mesosalpinx just below the ectopic pregnancy. Make sure that the needle is not in a blood vessel by aspirating before injecting. Intravascular injection of vasopressin may precipitate acute arterial hypertension and bradycardia and is contraindicated in patients with ischemic heart disease. Next, using a microelectrode, scissors, knife, harmonic scalpel, or laser, make a 1- to 2-cm linear incision on the antimesenteric side of the tube along the thinnest segment of the gestation (see the following images). At this time, the pregnancy usually protrudes out of the incision and may slip out of the tube (see the image below). 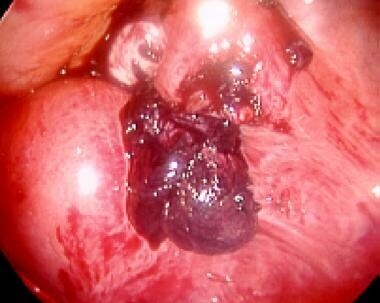 Laparoscopic picture of ampullary ectopic pregnancy protruding after linear salpingostomy was performed. Occasionally, the ectopic pregnancy must be teased out with forceps (see the image below). Ectopic pregnancy. Schematic of tubal gestation being teased out after linear salpingostomy. Alternatively, aquadissection, which uses pressurized irrigation to help dislodge the pregnancy, may be employed. 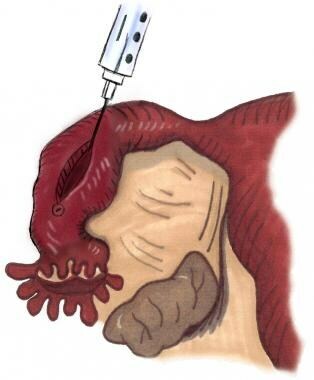 Insert the aquadissector, or a syringe filled with saline, deep into the incision. The pressurized fluid from the aquadissector (or syringe) dissects and dislodges the ectopic pregnancy and clots. Irrigate the bed well. If trophoblastic tissue remains, the prior injection of vasopressin may lead to anoxia and death of the trophoblasts, preventing postoperative growth. Further dissection may damage the tube and is not usually performed. Some ampullary pregnancies can be teased out and expressed through the fimbrial end (milking of the tube) by using digital expression, suction, or aquadissection. However, this approach carries with it a higher rate of bleeding, persistent trophoblastic tissue, tubal damage, and recurrent ectopic pregnancy (33%). Bleeding may be controlled by applying pressure with blunt tissue forceps for 5 minutes. Arterial bleeding may require pinpoint bipolar desiccation. Diffuse venous bleeding is best controlled with monopolar current. A spark or arc is created by using a current of 25-50 W through an electrode in noncontact mode. Uncontrollable bleeding may require application of a suture ligature to provide compression for 10 minutes. The ligature is then released. If bleeding continues, suture of the mesosalpingeal vessels may be attempted. The tubal incision is left open and not repaired. Infiltrate the mesosalpinx with vasopressin (20 IU in 50 mL of isotonic sodium chloride solution [ie, normal saline or NS]; some authors use only 10 IU in 50 mL of NS). Avoid intravascular injection because it is contraindicated in patients with ischemic heart disease. It frequently causes hypertension. With the knife or needle electrode, make a 1- to 2-cm incision on the antimesenteric side of the tube. Insert the aquadissector deep into the incision. Fluid from the aquadissector, under pressure, dissects and dislodges the ectopic pregnancy and clots. Irrigate the bed well. If trophoblastic tissue remains, the use of vasopressin may lead to anoxia and death of the trophoblasts, preventing postoperative growth. Further dissection may damage the tube and is not usually performed. The products of conception are then removed through the 12-mm sleeve. If necessary, products of conception can be reduced to smaller pieces with biopsy forceps or the aquadissector. Bleeding may be controlled by applying pressure with grasping forceps for 5 minutes. Arterial bleeding may require pinpoint bipolar desiccation. Diffuse venous bleeding is best controlled with monopolar current. A spark or arc is created by using a current of 25-50 W through an electrode in noncontact mode. Uncontrollable bleeding may require the application of an endoscopic loop to provide compression for 10 minutes. The ligature is then released. If bleeding continues, suture of the mesosalpingeal vessels may be attempted. In some cases, salpingectomy, either total or partial (see Partial Salpingectomy) is preferable to salpingostomy. This is true for isthmic pregnancies, where the endosalpinx is usually damaged. Patients with such pregnancies do poorly with linear salpingostomy and have a high rate of recurrent ectopic pregnancy. Total salpingectomy can be achieved by progressively coagulating and cutting the mesosalpinx, starting from the fimbriated end and advancing toward the proximal isthmic portion of the tube. At this point, the tube is separated from the uterus by coagulating and excising with scissors or laser. Clamp the tube between the uterus and the ectopic pregnancy using a Pean or similar clamp. Cut the pedicle free and ligate the pedicle with a suture ligature (see the following image). Clamp, cut, and ligate the tuboovarian artery, while preserving the uteroovarian artery and ligament. Continue to clamp, cut, and ligate the mesosalpinx until the tube is free and can be removed. Desiccate the tube between the uterus and the ectopic pregnancy using bipolar cautery. Compress and desiccate the tuboovarian artery while preserving the uteroovarian artery and ligament. Cut along the desiccated path, closer to the specimen, leaving a pedicle for hemostasis. Repeat until the tube is free and can be removed. Segmental tubal resection is performed by grasping the tube at the proximal and distal borders of the segment of the tube containing the gestation and coagulating thoroughly from the antimesenteric border to the mesosalpinx. This portion of the tube is then excised. The underlying mesosalpinx is also coagulated and excised, with particular attention paid to minimizing the damage to the surrounding vasculature. Delayed microsurgical reanastomosis can be performed to reestablish tubal patency if enough healthy fallopian tube is present. Take care to minimize the thermal injury to the tube during excision, so that an adequate portion of healthy tube remains for the reanastomosis. 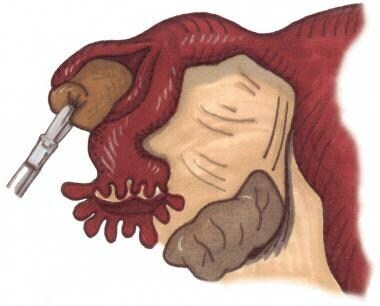 Place a clamp through an avascular area in the mesosalpinx under the ectopic pregnancy. This creates a space through which 2 free ties are placed. Tie the free ties around the tube on each side of the ectopic pregnancy. Cut free and remove the isolated portion of the tube containing the ectopic pregnancy. Perform bipolar desiccation across the tube on both sides of the ectopic pregnancy. Divide the tube at the sites of desiccation. The mesosalpinx under the ectopic pregnancy can then be either desiccated or ligated with an endoscopic loop. Remove the products of conception. Grasp the fimbria and insert the aquadissector or a syringe filled with saline. Fluid under pressure dissects and dislodges the ectopic pregnancy and clots. Remove the products of conception. Grasp the fimbria and rotate it to allow insertion of the aquadissector. Fluid under pressure dissects and dislodges the ectopic pregnancy and clots. Remove the products of conception. Proper pain control and hemodynamic stability are important postoperative considerations. Most often, patients treated with laparoscopy are discharged on the same day of surgery; however, overnight admission may be necessary for some patients to monitor postoperative bleeding and achieve adequate pain control. Patients treated by laparotomy are usually hospitalized for a few days. Patients who were in shock or had to receive blood transfusions generally require a longer postoperative observation period, which should include observation that the kidneys are functioning normally and the patient has regained normal hemodynamics. The prognosis for patients with an ectopic pregnancy is good for those with an early diagnosis. Conservation of fertility is frequently achievable. The earlier the diagnosis is made and treatment administered, the higher the likelihood of subsequent fertility. Thirty years ago, when the diagnosis was seldom made before rupture, the likelihood of a subsequent healthy term pregnancy was only approximately 35%. Currently, that number is closer to 85%. The difference is in the earlier diagnosis and treatment before the ectopic pregnancy can grow large enough to severely damage the tube. Another factor in the improved fertility rate may be related to the decrease in salpingectomies and the increase in salpingostomies. In a retrospective cohort study of 651 women who underwent an operation for their first ectopic pregnancy, Bangsgaard et al reported a fertility rate of 88% after conservative surgery (salpingostomy) versus only 66% after radical surgery (salpingectomy). They also found no difference in recurrence rates for ectopic pregnancy in the 2 groups. However, 8% of the group that underwent conservative treatment had persistent ectopic pregnancies. These were all treated with either methotrexate or repeat surgery. This shows the need to monitor all conservatively treated patients with serial beta human chorionic gonadotropin (β-hCG) measurements until values return to negative. Cervical pregnancy is not exactly a complication but should be discussed nonetheless. A cervical pregnancy is an ectopic pregnancy that has implanted in the cervix. It can cause severe hemorrhage if it starts to separate from the cervix. Few muscle fibers are in the cervix; thus, no constriction occurs around the hypertrophied blood vessels that developed for the pregnancy. With no pressure on the vessels, profuse hemorrhage can occur. In recent years, ultrasonographic imaging has improved to the point where the diagnosis of cervical pregnancy is made much more frequently in asymptomatic patients. The improvement in diagnosis has made many more management options available. Previously, the only option was surgical treatment, with curettage of the implantation site. This often led to such profuse hemorrhage that surgeons recommended opening the patient’s abdomen and placing ligatures around the uterine arteries or hypogastric arteries before starting the curettage. Hysterectomy was frequently the result. Currently, the recommended treatment is either hysterectomy for those who do not desire fertility or methotrexate for those who do. Because patients who receive methotrexate occasionally develop severe hemorrhage, they should be observed closely for 1-2 weeks after therapy. An interventional radiologist should be available for arterial embolization if severe hemorrhage occurs as the pregnancy separates from the cervix. After surgical excision of the ectopic gestation, weekly monitoring of quantitative β-hCG levels is necessary until the level is zero to ensure that treatment is complete. This is especially true after treatment with conservative surgery (ie, salpingostomy), which carries a 5-15% rate of persistent trophoblastic tissue. The average time for β-hCG to clear the system is 2-3 weeks, but up to 6 weeks can be required. After tube-sparing surgical removal of an ectopic pregnancy, a fall in β-hCG levels of less than 20% every 72 hours represents incomplete treatment. Although most of these cases are caused by incomplete removal of trophoblastic tissue, some actually may represent multiple ectopic pregnancies in which only 1 gestation is initially recognized and treated. The incidence of persistent trophoblastic tissue is greater with higher initial β-hCG levels and is relatively rare with titers less than 3000 IU/L. The risk of persistent trophoblastic tissue is very significant with a hematosalpinx greater than 6 cm in diameter, a β-hCG titer greater than 20,000 IU/L, and a hemoperitoneum greater than 2 L.
Whereas resolution without any further intervention is the general rule, the persistence of trophoblastic tissue has been associated with tubal rupture and hemorrhage even in the presence of declining β-hCG levels. Further medical treatment with methotrexate or surgery in symptomatic patients may be necessary if β-hCG levels do not decline. Some authors have suggested administration of a prophylactic dose of methotrexate after conservative surgery to reduce the risk of persistent ectopic pregnancy. Patients should all be on some form of effective contraception until their β-hCG levels have returned to nonpregnant levels. Lipscomb GH. Medical therapy for ectopic pregnancy. Semin Reprod Med. 2007 Mar. 25(2):93-8. [Medline]. Stovall TG, Ling FW, Gray LA. Single-dose methotrexate for treatment of ectopic pregnancy. Obstet Gynecol. 1991 May. 77(5):754-7. [Medline]. Hoover KW, Tao G, Kent CK. Trends in the diagnosis and treatment of ectopic pregnancy in the United States. Obstet Gynecol. 2010 Mar. 115(3):495-502. [Medline]. Mol F, Mol BW, Ankum WM, van der Veen F, Hajenius PJ. Current evidence on surgery, systemic methotrexate and expectant management in the treatment of tubal ectopic pregnancy: a systematic review and meta-analysis. Hum Reprod Update. 2008 Jul-Aug. 14(4):309-19. [Medline]. Bangsgaard N, Lund CO, Ottesen B, Nilas L. Improved fertility following conservative surgical treatment of ectopic pregnancy. BJOG. 2003 Aug. 110(8):765-70. [Medline]. Mol F, van Mello NM, Strandell A, et al. Salpingotomy versus salpingectomy in women with tubal pregnancy (ESEP study): an open-label, multicentre, randomised controlled trial. Lancet. 2014 Apr 26. 383(9927):1483-9. [Medline]. An endovaginal ultrasound revealing an approximate 6-week intrauterine pregnancy. A yolk sac (ys), gestational sac (gs), and fetal pole (fp) are noted. An endovaginal ultrasound image demonstrating an early ectopic pregnancy. An echogenic ring (tubal ring) found outside of the uterus can be seen in this view. An endovaginal ultrasound revealing a complex mass outside of the uterus, with a small yolk sac present within. The mass is more echogenic compared to the uterus above and represents an ectopic pregnancy. Disclosure: Received consulting fee from Intuitive Surgical for proctor; Received consulting fee from Conceptus for proctor.